First, thank you to all of you who have been so patient with me regarding my lack of updates here at S&TI! I also really appreciate the supportive comments you left on my last post; the past few weeks/months have been über stressful and any handhold of strength or confidence I can find, means the world to me. On the work front, I have just one last chapter left to write for my dissertation, which I'm hoping to knock out this week along with continuing edits on my remaining chapters (though in happy news, my advisor got back to me about my Intro chapter yesterday and said she thinks it's pretty much done!). I've also set a date for my defense! So, if I keep my nose to the grindstone for the next few weeks, come 4 pm CST on Thursday, May 24, I should finally be Dr. Steph! I am simultaneously excited and terrified. Please bear with me as I push through these last few hurdles and finally close what has been an extremely tumultuous chapter of my life and get ready for the next one! Speaking of which, clearly what I need to do right now is start a new online writing venture, right? Probably not, but after some serious thought, Tony and I decided it would be best to document our impending RTW trip on a separate site specifically dedicated to this trip and to travel. I know not everyone who visits S&TI! is interested in things other than books, and given the scope of what we want to do, we realized it would just be really hard to fit our upcoming adventure into the existing framework of this site. So, for those of you interested, all of our trip-related posts will be housed over at our new site: Twenty Years Hence (www.20yearshence.com). We just launched it yesterday night, so we still have some tweaks to make to it, but our first post is already up, in which I explain the meaning behind our new blog's name. There are surely some kinks to work out, but we wanted to give our longtime readers a heads up and first look at our new digs! 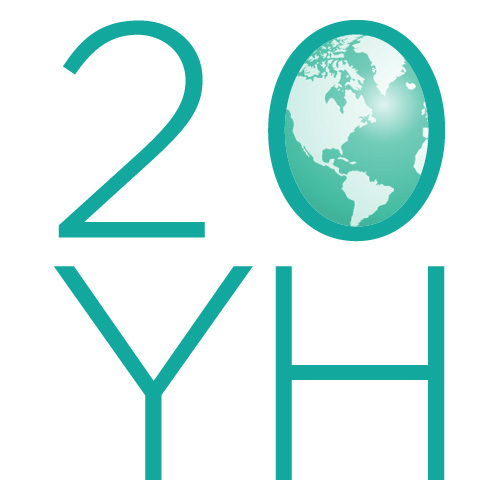 If you're at all interested in following us on our adventures, we'd love if you bookmarked 20YH or added it to your feedreaders. Also, for those of you worried about the fate of S&TI!, please don't! I fully intend to continue/re-commence blogging here about books once my dissertation is finished. I have no idea what my reading life will be like while we're on the road fulltime, but rest assured that anything I read, I'll document here. S&TI! is not being replaced or phased out, we're just starting a new venture to coincide with a big change in our life and a shift in our priorities. Our hope is that by taking this trip, our lives will be richer and fuller and we'll have more time to devote to the things we are really passionate about. Like this site! So thanks again for your patience and your support and Tony & I look forward to having double the fun with y'all! Guys! The dissertation! It is killing me! BUT. It is also kind of almost done! I don't want to jinx myself (despite being a scientist, sometimes I am oddly superstitious), but I now have about 75% of my thesis written! While there will surely be plenty of edits to occupy me, the bulk of the writing that remains at this juncture is the intro and discussion for my final experimental chapter, and then my final, general discussion chapter. That's it! Somedays I wake up thinking I am never going to slay this beast (it's like the Hydra... I never seem to have a chapter completely finished and put to bed), but I know I've been working hard and so long as I keep putting one foot in front of the other (or I guess, one word in front of the other), I'll eventually win out. I've read somewhere that writing a dissertation is largely an exercise is perseverance rather than brilliance, so luckily I have stubbornness in spades. Right now I'm hoping/planning/fearing defending sometime mid-May, and once I have, then I'll finally be freeeeeeee! And I can fling myself black into blogging's sweet sweet embrace. So yes, I'm sorry that I pretty much only update once per month around these parts when I have a new review up at BookPage, but if ya'll can give me just another month, hopefully my rag-tag blogging will be at an end as I'll have the mental real estate to properly devote to this space. Tony and I have also been making some headway on planning our big trip, and I keep saying, "Oh, I should write about this! This would be helpful/useful." And then I don't. But again, once I'm no longer writing a 100+ page document that culminates my academic career, I will also be more revealing on the trip front as well. Mostly, I want to thank all of you who commented with words of support and offered up ideas and suggestions. Right now we're just taking things one day at a time, but the earliest we'd be setting out is late August, so there's still plenty of time to get all the tips and low-downs before we head out to parts unknown! What are these "books" of which you speak? Anyway, back to books (like back to basics, but better). In the April issue of BookPage (which has been out for TWO weeks now... April, why you gotta go so quickly?! 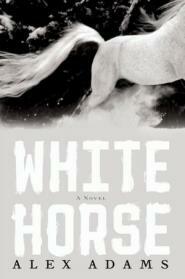 ), I review Kiwi author Alex Adam's first installment in a post-apocalyptic thriller, White Horse. Fiction editor (and good friend), Trisha, was really surprised that this is what I chose to go with, but y'all know I need at least one dystopian fic per year. Plus, when you're writing your thesis up, it feels like the end of the world, so apocalypse lit just seemed right. I'm no stranger to "the world is dying but I must sally forth in order to survive" type novels, and to some extent, this is well trod ground, but Adams manages to make it all fresh. It was incredibly harrowing to read, and the writing was rather sublime in parts, so if you've got a hard-as-nails constitution that can stand books that get rather explicit in their gore, then I recommend it. Check out my full review here and let me know what you think!